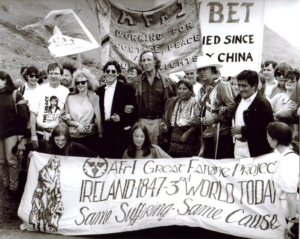 Famine Walk 1994, lead by, amongst other, Gabriel Byrne, John Pilger and Waylon Gary White Deer. Choctaw/Ireland Connection: During a lecture in upstate New York, Mullan learned of a little known story of a donation of $170 by the Choctaw Nation to Ireland in 1847, all the more remarkable considering they had suffered their ‘Trail of Tears’ removal from Mississippi to Oklahoma beginning in 1831. This story was important as it demonstrated the humanity of indigenous people, often characterized as ‘uncivilized’ by European colonizers who were responsible for their suffering, oppression and in some instances, their genocide. In 1989 Mullan was the first Irish person to travel to Oklahoma, accompanied by his father-in-law, Dermot Beatty, to thank the Choctaw for their humanity and invited the First Nation to lead the annual AFrI Famine walk in 1990. The Choctaw’s participation in the AFrI walk in 1990 was broadcast in over 50 countries by Worldwide Television News (WTN). WTN, now part of the Associated Press, has the story listed in their archive, but it has not yet been digitised. Mullan was made an honorary Chief of the Choctaw Nation at the start of the walk, an honour he shares with former Irish President, Mary Robinson. President Robinson followed Mullan’s lead in 1995, travelling to Oklahoma to thank the Choctaw for their humanity. The Doolough Famine Walk has since been joined on several occasions by the distinguished Choctaw artist and author, Waylon Gary White Deer. The connection has also inspired several poems, songs, artwork and radio and television documentaries. The most recent documentary was by RTE’s Nationwide on 7 March 2018.